Two silk manufacturers from Krefeld – Dr. Josef Esters and Hermann Lange – com-missioned Ludwig Mies van der Rohe with the design of neighbouring houses and gardens at the end of the 1920s. The gardens were conceived in relation to their effect on the buildings but it is un-clear whether Mies van der Rohe personally influenced their design. The language and form of the buildings is reflected in the precisely placed windows looking out onto the gardens, the lines of sight from the terrace, the views of the zoned gardens and the deliberately positioned groups of trees and solitary plants. Like the architecture, the large stretches of lawn, straight paths and flowerbeds em-body clear geometrical principles, reflecting the continuity of the outer and inner ar-eas. Although they are not identical, the redbrick villas, which were built in 1929, reveal similarities as a specially conceived ensemble: traditional architectural design and the objectives of Bauhaus architecture are linked in their clear geometrical form. While the houses are closed off to the street, they both use tall windows to draw the outside area into the rooms in the manner of landscape scenes. The architecture of Haus Esters and Haus Lange is pared down to the essentials and the bright interiors of the buildings are dominated by spaciousness and transparency. 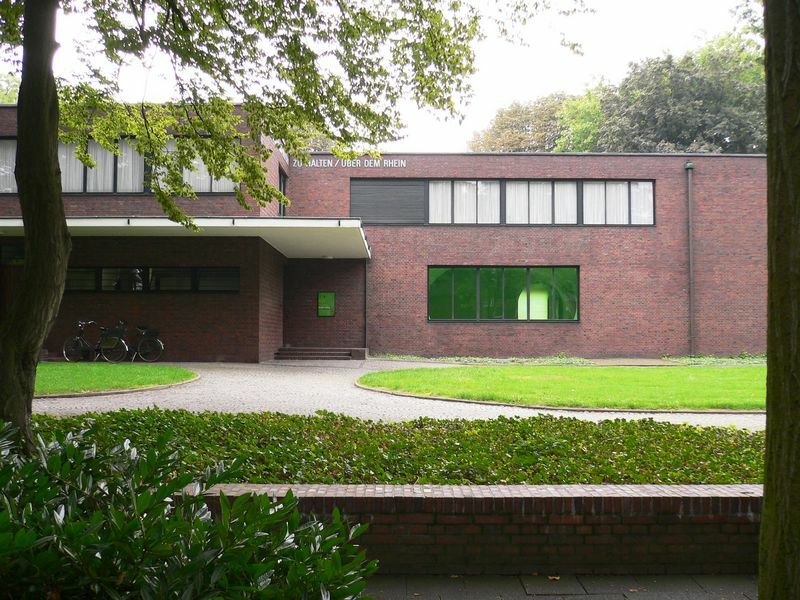 More than 75 years after their construction, the villas and their gardens constitute an architectural jewel of classical modernism, which is now used for contemporary exhi-bitions by Krefeld’s art museums. In the 1920s, Krefeld’s silk industrialists constituted the town’s prosperous middle classes and the town still stands for fabric and silk manufacturing today. Two silk manufacturers – Dr. Josef Esters and Hermann Lange – commissioned Ludwig Mies van der Rohe with the design of two neighbouring houses at the end of the 1920s. It remained unclear for many years whether Mies van der Rohe had also influenced the design of the gardens. This was only confirmed at the beginning of the 1990s during a survey of historical open spaces undertaken by Krefeld’s Grünflächenamt, which is responsible for the care of green spaces. Only detached or semi-detached structures were permitted when the houses were being built on the two Wilhelmshofallee sites. This was in accordance with the thinking of the period, which was that buildings of this type would guarantee sufficient air and light. A development plan specified in particular that the area should have the character of a garden city. Quiet residential streets and green roads and squares were laid out as well as front gardens enclosed at a low level and at least 7 metres in length. This layout permitted a two-way view – of the open landscape on the one hand and the generously-proportioned buildings on the other. In the case of Haus Esters, Mies van der Rohe changed an already existing house garden into a typical villa garden of the 1920s. As the plans for the Lange garden have not survived, it is only possible to surmise the extent of the famous architect’s influence on it. The similarity of both gardens merely indicates a possible influence. Large stretches of lawn were laid out as well as straight paths and flowerbeds, which, like the architecture, follow clear geometrical principles and take up the form and language of the buildings. The functionality of the gardens in terms of their use of space and their various plants is maintained in the case of both sites; the gardens are “of a piece” and yet are not identical. 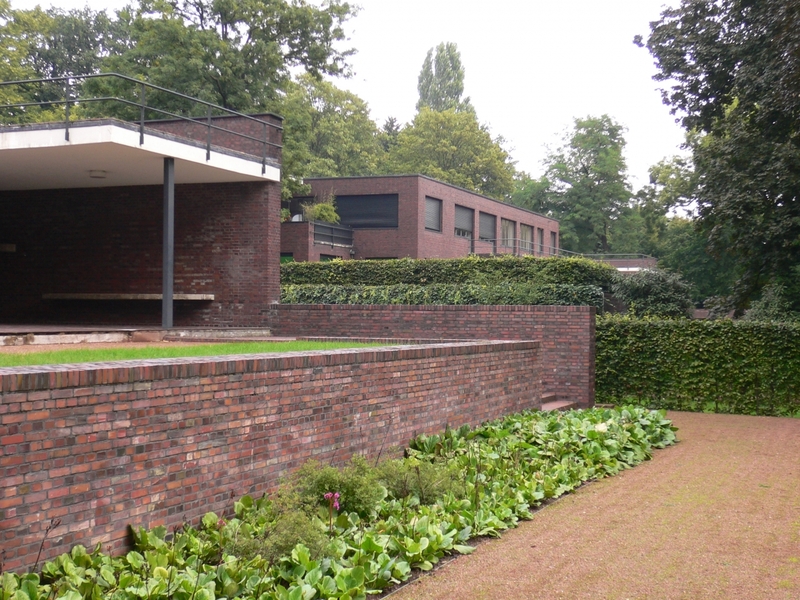 Mies van der Rohe dealt with variations in the terrain’s level by building low supporting walls, so that one part of the garden was at the same level as the terrace – a design which was as yet rare at the turn of the century. It was thus possible to walk straight out into the rose garden at ground level at Haus Ester. Like the beds of herbaceous perennials, the rose garden no longer exists today. The supporting walls are like foundations. They form the end of the terraces and guide the visitor’s view across the straight sections of the gardens and out into the surrounding area. Lines of sight were formed by solitary plants and groups of trees, which were planted in deliberately chosen spots. These lines of sight enter into a dialogue with the central areas of the gardens. The trees and herbaceous perennials function like a backdrop, framing the landscape and buildings as a unified ensemble. Special parts of the gardens sectioned off by shrubs and plants guide one’s view from the terrace to the surrounding area and focus the eye on the unity of green gardens and buildings in the distance. The design of the areas in front of the houses is also impressive: large driveways flanked by shrubs mirror each other. Areas of lawn and low walls make it possible for one to stand in the street and look across the front gardens and ensemble of buildings into the gardens behind the houses. Today, the plants around the edges are mostly a combination of those with pinnate leaves (e.g. robinia, wing nut, flowering ash) and round leaves (linden tree, hornbeam). This type of planting takes its orientation from contemporary specialist literature at the beginning of the 20th century and still conveys essential elements of garden culture among Krefeld’s middle-classes. Fortunately, it was possible to retain the buildings with their front and back gardens as an ensemble as well as the structure and clarity of the architecture within the context of landscape, nature and garden design. In 1955, the son of the original owner made Haus Lange over to the town of Krefeld. It was then used as a contemporary location for exhibitions. Within a short time, artists such as Yves Klein incorporated the gardens into their installations. 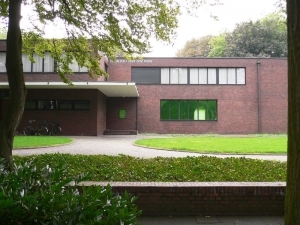 The Esters family lived in their house until it was bought by the town of Krefeld in 1976, after which the art museums were moved there. Since then, a sculpture park with works by Ulrich Rückriem, Claes Oldenburg, Richard Serra and Ludger Gerdes has supplemented the exhibitions in Haus Esters and Haus Lange. Old aerial photographs and archive records from Krefeld were used to restore the gardens in 2000 while taking into account aspects concerning their preservation. The gardens thus now constitute an ensemble of architecture and garden design which is of great artistic, historical and scientific value. Spelberg, Almuth (1993) In: Rheinische Heimatpflege H 4, 1993. Spelberg, Almuth (1993) In: Die Heimat, Zeitschrift für niederrheinische Kultur- und Heimatpflege, Jahrgang 64, November 1993, Krefeld. Tuesdays to Sundays from 11 a.m. until 5 p.m. Accessibility: Visitors with limited mobility will require assistance on the paths.